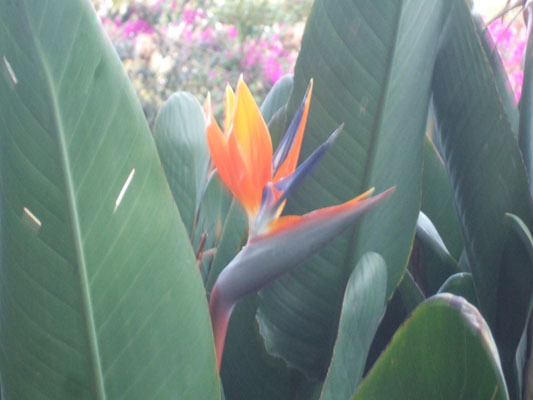 Here we are in January and we have "Birds of Paradise" blooming in our front yard. Not trying to rub it in to those of you who have had to endure a harsh winter, but just sharing what life is like here in central Mexico. This beautiful exotic flower is native to South Africa, and just like us birds, handles this place quite well. One of the traditions that happens on January 1 throughout the world is the Arctic Plunge. 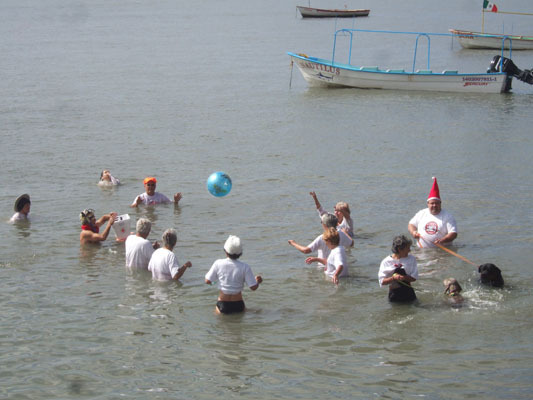 Here our brother-in-law, Wayne, joined a bunch of folk to continue that tradition here at Lake Chapala. It was also a fundraiser for Red Cross. 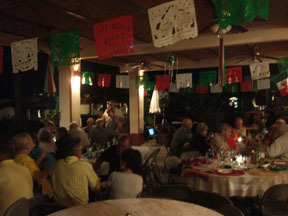 Later that evening, we hosted a New Year's Day party. Glorine's three grandnieces survived ringing in the New Year here in Ajijic. 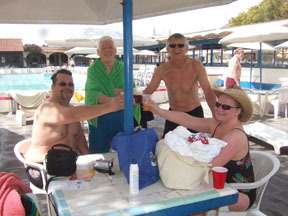 Friend Jean, along with about 15 other people joined us in celebrating the beginning of 2011. 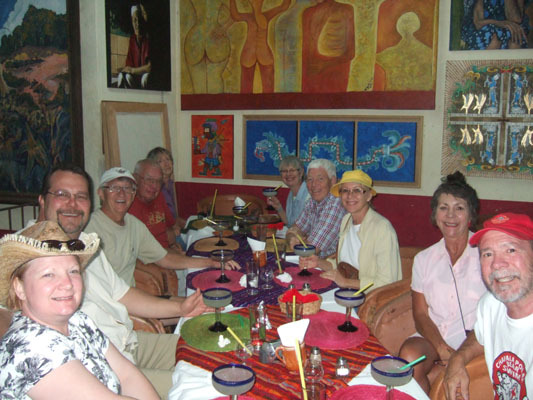 There are literally more restaurants along Lake Chapala than days in a year. 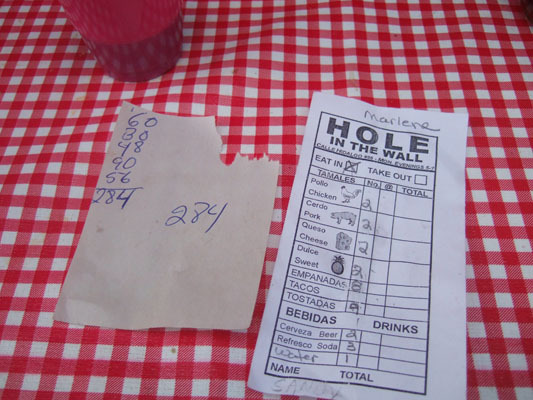 But we have our favorites, including one called "Hole in the Wall". 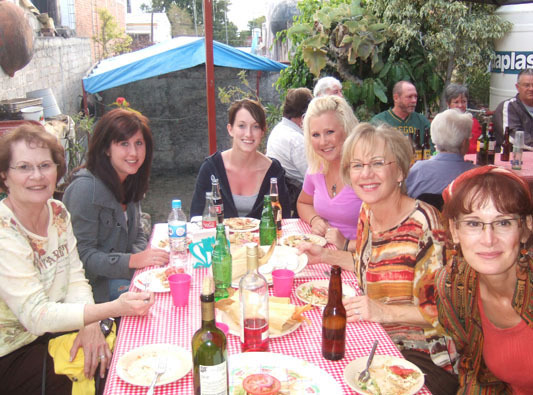 It is run by a couple of nice Mexican women who cook up true authentic Mexican food. But what shocks people more than anything is the cost. Here is the bill for the meals for eight of us, including drinks. 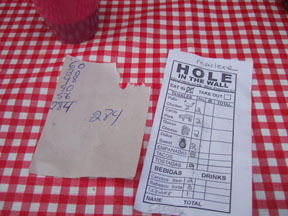 The total bill was 284 pesos, which is about $25 US dollars (more or less). It is nearly time to say farewell to sister Marlene and her three beautiful granddaughters. 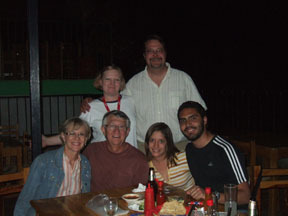 About 12 hours after this picture was taken, we were on the road to the Guadalajara airport for their flight home. It was a great six days but it went by too quickly. It was sure fun getting to know them better. Every night is social night. Most of our friends narrow that down to most Wednesdays and Fridays and we move from night club to night club to keep the socials fresh and exciting. Here we are at the newly discovered restaurant where we celebrated New Year's Eve. 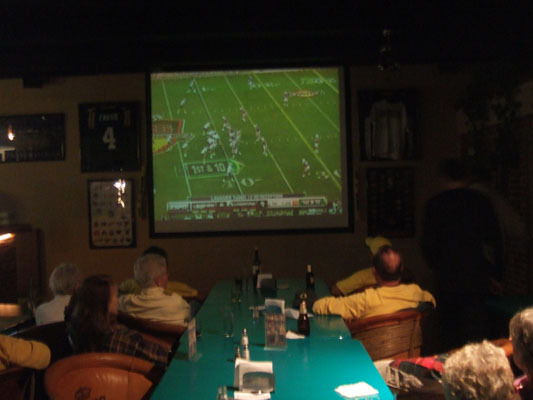 With Boise State University football team derailed from its path to a big playoff berth by the University of Nevada, we settled for cheering on the University of Oregon in its losing battle against Auburn University for the National College Football Championship. It was a fun game to watch, even though our team lost. Randy and Marla, Larry's nephew, came to Ajijic for a week to thaw out from the bitter cold of North Dakota. 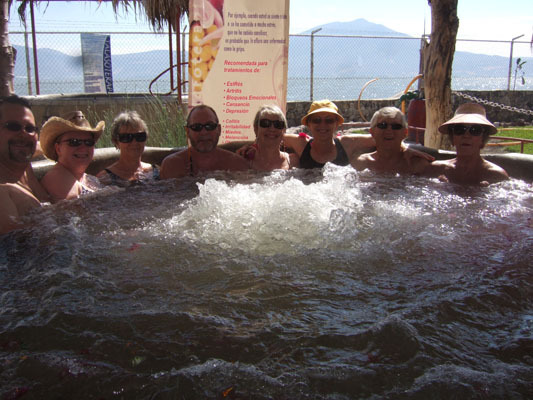 Here we are enjoying the hot springs with friend Brian toasting to another great day on Lake Chapala. One of the things we treat all of our out-of-town guests to are the mineral baths that include six tubs with different herbs and fragrances, including, coffee and milk, all with their "proposed" healing properties. 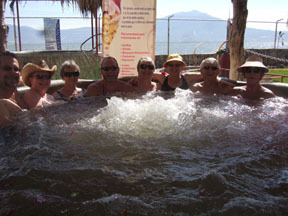 If nothing else, the comradely of friends and family going from tub to tub is worth the price of admissions. 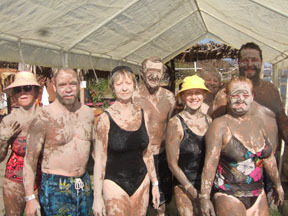 One of experiences of the spa is the mud. Here we rub moist clay all over our bodies and let it dry before soaking in the last hot tub to clean up. They say it helps exfoliate and soften the skin, but also to relieve stress, aches and pains, and even some painful medical conditions. 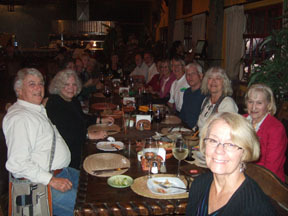 After a fun day at the spa, we were greeted with happy hour and a great meal at a nearby restaurant called Viva Mexico. 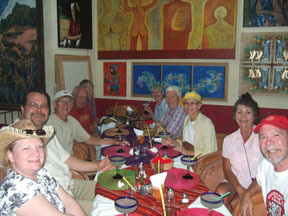 Like most restaurants the meals were inexpensive and this was exceptional high quality. The art work throughout the place was also exceptional. On Wednesday, we went to the Tiangas (farmers market) and Randy noticed fresh shrimp. After learning that he knew how to de-vein them, we bought 2-1/2 kilos or over five pounds of shrimp. We invited Jerry, Gloria, Brian and Marilyn to join us. After an hour of de-veining and another hour of grilling, we sat down for an early dinner and ate "the whole thing" plus vegetables and fruit. After this hefty meal, we had to work it off. So we headed to a nightclub and danced and danced. 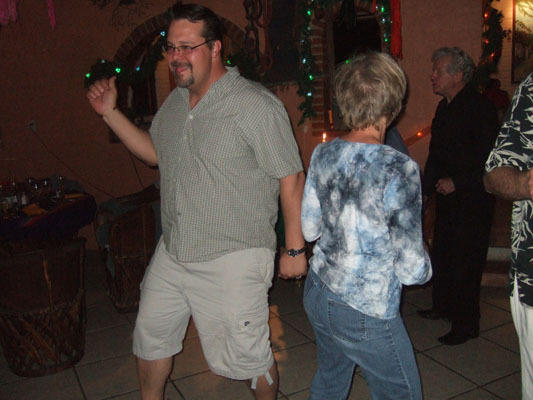 Here Randy is trying to keep up with Glorine and her new dance steps she learned at ZUMBA. 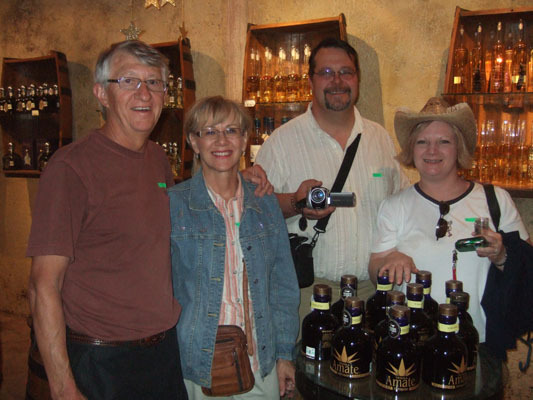 Welcome to Tequila-the home of tequila and the most tequila distilleries in Mexico. Here Mexican workers are harvesting blue agave (pronounced ah-gah-vey) much like it was done hundreds of years ago. 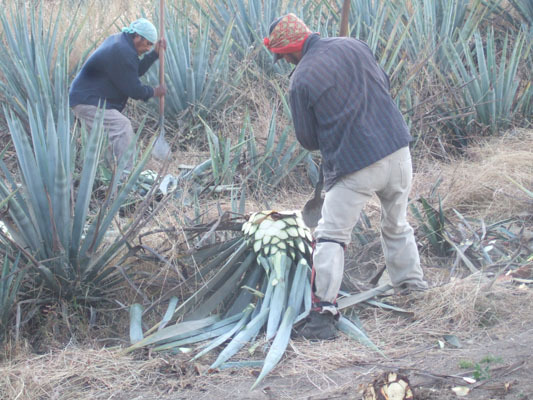 In order for this alcohol to be called tequila, it must be made from blue agave. 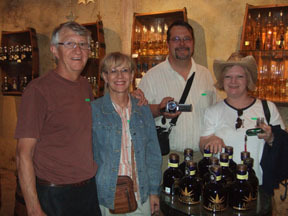 After a tour of the city of Tequila and this nearby distillery, we finally hit the sampling room. The gal working here did not hesitate to give us all the samples we wanted. This is fine sipping tequila (no shooters please). On display were five different types of tequila: from clear to various shades of gold, depending on the length of aging in oak barrels. 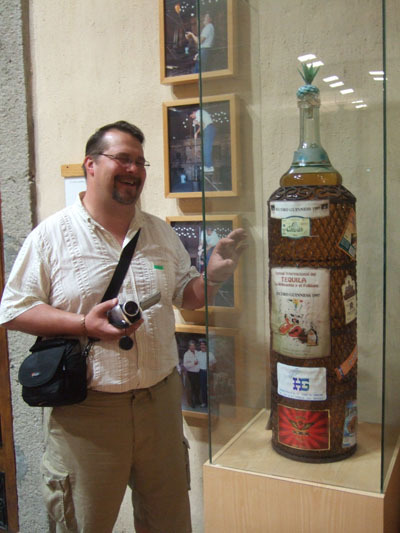 Here we are at the Randy size bottle of tequila. Sorry, it is not for sale--for display purposes only. On the tour we met this young couple, both (English speaking) law students taking a break from their studies and what a great place to relax than Tequila, Mexico. 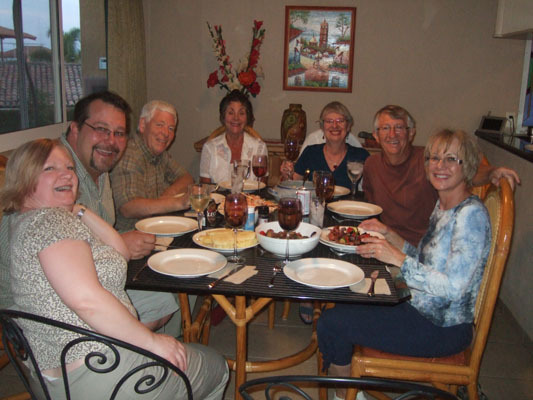 Randy invited them out to dinner with us, which turned out to be a wonderful way to learn more about Mexico and the various cultures. 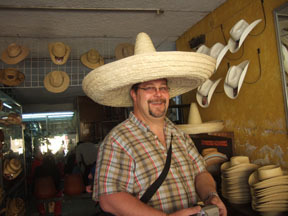 After spending the night in a hotel right on the Plaza in downtown Tequila, we spent time walking around the city center and did some shopping. While this hat fit Randy perfectly, he bought a different hat that would fit better in the culture of Western North Dakota. 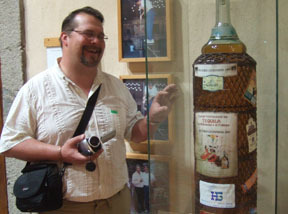 Before leaving Tequila, we stumbled across this small Tequila distillery and met the owner pictured here. It was in a "non-descript" building near downtown Tequila called El Gran Jubilee distillery. 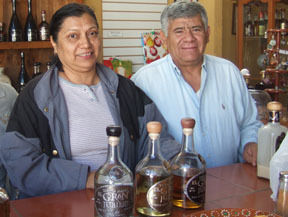 In July 2010 they received awards at the Los Angeles International Wine and Spirits Competition--a Gold Medal for their Blanco and two Silver Medals for their Reposado and Anejo tequilas. From here we went to Guadalajara briefly, then back to Ajijic. It was fun having Randy and Marla spend time seeing the life we created for ourselves. As always, the time was way too short. 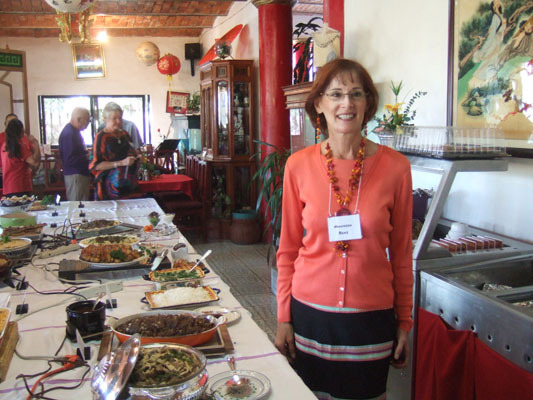 The Culinary Arts Society of Ajijic (CASA) is yet another organization that brings together people of similar interests to share their talents and learn from one another. Here Maureen is standing by her beef stroganoff creation. CASA meets once a month and members get to share their culinary creation. Independent judges pick the top three dishes in each category. 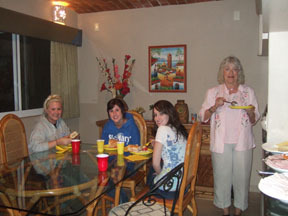 We were invited as guests of Maureen to sample all these great dishes. Each year, El Parque puts on an event called "Mexican Night" to recognize and celebrates its culture, food, decorations and music. 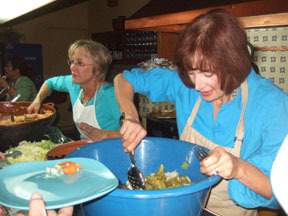 Here Glorine and Maureen pitched in to help serve authentic Mexicans food to the nearly 75 people who attended. 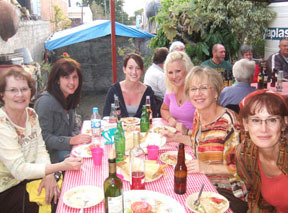 This event was open to both residents and non-residents of El Parque, so we invited some friends to join in on the great food and festivities. Ricardo played some great dancing music and kept the place hopping for hours. 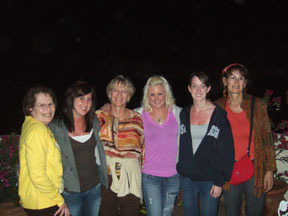 January was another fun filled month with family and friends and a great way to kick off the new year.